Have you ever heard of cleansing our bodies? We know that life in the 21st Century is full of stress and environmental toxicity. We have over a hundred thousand toxic chemicals in our surrounding environment that we are interacting with regularly. A lifestyle built around daily detoxifying strategies and periodic cleansing periods is essential to health in the modern world. Researchers estimate through various studies that the average person living today is carrying a minimum of 700 known toxins in their blood, skin, fat tissue, brain tissue, liver, digestive and other organ systems (1, 2, 3, 4). Some of the major contaminant agents are found in household cleaning agents, personal hygiene products, lawn care products, food, water and other drinks as well as the air we are breathing. The body does everything it can to bind and eliminate these chemicals every day. The major eliminatory organs are the colon, skin, kidneys and lungs. These organs should go through a daily detoxification process. If this doesn’t happen the waste products and toxins accumulate in the cells and tissues of the body. This toxic bioaccumulatory process causes inflammation and damage that leads to chronic disease and abnormal brain and nervous system activity (5, 6). The digestive system, kinetic energy system and immune system all compete for energy. When we are eating throughout the day it drives more energy into our digestive system and away from our immune system. This is especially true if we are eating low-energy foods such as sugars, grains and other processed foods. Low energy foods and other environmental toxins cause a back jam in the digestive system and eliminatory organs. This creates an environment for opportunistic parasites to thrive. The parasites excrete more toxic substances that effect lymphatic function, cellular oxygenation and immunity. The goal of a cleansing program is to flush out impurities and optimize function. It gives the over-burdened internal organs time for physiological rest and rehabilitation. This allows the body to free up energy to enhance healing processes. This also allows the body to utilize enzymes for clearing out parasites and abnormal cell development. During a cleansing period most people will feel a myriad of different experiences. Many feel tired and weak for the first two days and then often feel clear and peaceful by the third day. Some people remark that they feel the best while they are cleansing while others feel awful. Daily detoxification strategies include an anti-inflammatory diet that is low in sugar and starch. This lifestyle is loaded with fermented foods, anti-oxidant rich superfoods and herbs. The bulk of the calories should come from good fats such as coconut and avocados and clean proteins from organic and grass-fed animal products. Cycles of intermittent fasting with quality fluid intake for periods of 12-18 hours daily are highly beneficial for eliminating a majority of toxins consumed that day. Periodic cleansing periods where solid food is eliminated for periods of 24-72 hours are highly recommended. Water fasting is not recommended as it can lead to key electrolyte deficiencies that can wreak havoc on the body. 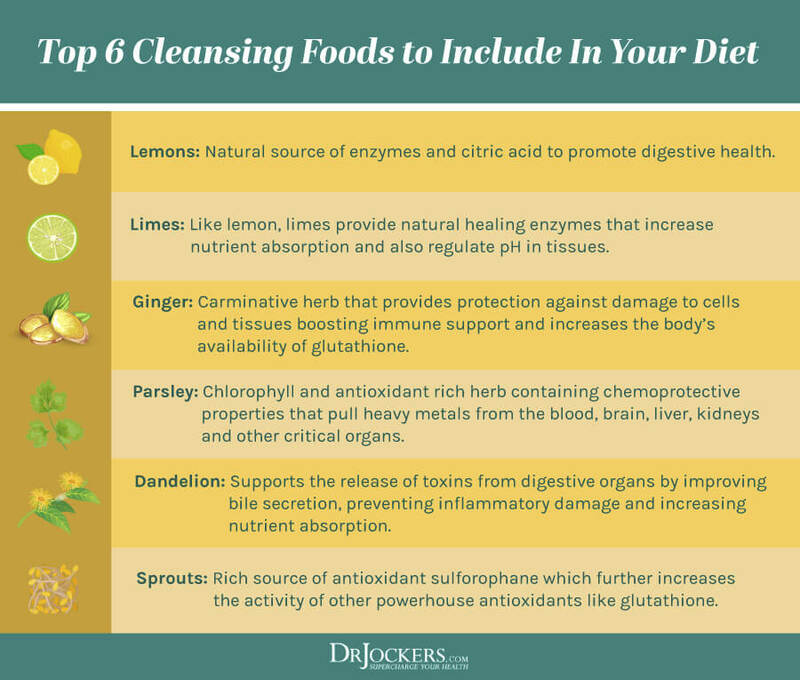 An appropriate cleanse should be supported with fermented drinks that provide potassium, enzymes, organic acids and B vitamins to resource the eliminatory channels. It is also advantageous to use coconut oil during the cleansing period to enhance detoxification processes. Coconut oil feeds the immune system and helps provide medium-chain triglycerides that destroy parasitic microorganisms. It also helps to provide a clean energy source for the brain and reduces inflammation. 10. Use a High Quality Detoxification System: Using a detoxification system can help sweep out the toxins you are exposed too on a daily basis. This is not a harsh colon cleanse that leaves you on the toilet all day, but instead it promotes a gentle and comfortable detoxification process that will not interfere with your daily life. Within days most people notice they have improved energy, less pain, mental clarity, improved complexion and they sleep deeper. I have seen fantastic health results both personally and professionally using this product system. Ann, there are 2 major products that I recommend. You can do a SueroCleanse through Beyond Organic. Check out the Beyond Organic tab on DrJockers.com This is a 3-day cleansing fast with Seuro – which is a cleansing beverage loaded with enzymes, organic acids probiotics and key electrolytes like potassium. You can also use the Daily Detox product through Maximized Living. This has 2 parts: The first is a glutathione booster that enhances intracellular anti-oxidants to protect the DNA and push toxins out of the cell and the second is activated charcoal combined with carminative superherbs that help bind to toxins and pull them out of the system. You know, I’ve seen hundreds of these Detox things talking about all the bad toxins, but I have never once seen anything ever mention the name of single toxin. I would love for someone to be able to tell me the names of some of the “toxins” that are in our bodies. I am sure you have heard of pesticides, herbicides, heavy metals such as mercury, aluminum, arsenic, lead and industrial waste such as dioxins, bromide, flouride, disinfectant byproducts, polycylic hydrocarbons, heterocyclic amines, formaldehyde, parabens, BPA, pthylates, etc. We are exposed to rampant amounts of all of these. When you are finished with those – we have about 10 more articles discussing these toxins and others.